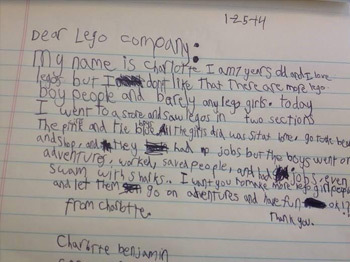 Charlotte Benjamin, a seven-year-old from the UK, has written a firmly worded letter to LEGO headquarters. Charlotte Benjamin is a seven-year-old girl from the United Kingdom who has a soft spot for LEGO blocks. Unfortunately, since LEGO traditionally focuses on its dude-infested fan base, groupies like Charlotte are left in the lurch. But, while most little girls would simply refocus their attention on another toy, Charlotte is asking LEGO to repent. "I don't like that there are more Lego boy people and barely any Lego girls," she writes in a firmly worded letter to LEGO. "I want you to make more Lego girl people and let them go on adventures and have fun. OK!??" Over the last few days, Charlotte's letter has become a minor phenomenon on Twitter and other social networks. So far, it has been shared and retweeted over 3,000 times, but that's probably just the tip of the iceberg. LEGO hasn't responded with the apologetic acknowledgment that Charlotte probably would have liked, but Emma Owen, a spokeswoman for LEGO UK did address the issue. "In general we believe that LEGO play appeals to children of both genders and all ages," she said. "Building with LEGO bricks fosters the creativity of children which is why it's our mission to offer any child - regardless of their age, gender or interests - a relevant LEGO play experience." Owen added: "We have a variety of female minifigures in our assortment."